Hope everyone had a good May 24th holiday. Rain as usual (sure sympathize with the visitors and campers to this area) but it's good for the lawn and the gardens. The crowns of rhubarb I have struggled with the last few years are doing quite well so far and I see the stalks and leaves are much thicker and sturdier this year. I pour all of my kitchen compost around them daily. Speaking of visitors, my Mother is here in Ontario from British Columbia visiting. She's not at my home yet, but I think she's petrified I'll serve her the rhubarb flavored coffee I recently wrote about. Did I ever mention she hates rhubarb? Hates the stuff, and is happy to tell me all about it too. (something rather evil about that, don't you think?) However, she DOES attempt to help me out, and forwards recipes she finds. Here's one more for a crumble. Every recipe is just a little different catering to different tastes. In a food processor, pulse approximately 1 minute all topping ingredients. Spread evenly over filling. Bake 45 - 60 minutes until lightly browned, juices bubbling. Let sit on a rack to allow thickening for at least an hour. Did ALOT of updating on the website for upcoming and verified dates of the Rhubarb Festivals. Check them out. There are quite a few in the first few weeks of June in the States, and the big one here, The Rosy Rhubarb Festival in Ontario, starts June 10th in Sheddon. If you haven't been to a rhubarb festival, heres a sample of the events coming up in Lanesboro June 4th. 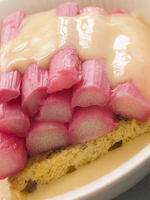 Every year, all festivals seem to invent more crazy things to do with rhubarb. Did everyone tune into the Royal Wedding last month? It was hard to miss, wasn't it? Sweet canapes served included rhubarb creme brulee tartlet at the afternoon luncheon reception. Hardly a surprise I think, since the Uk is known so well for their rhubarb. There are recipes on the site for rhubarb brulee if interested. Just check the navigation bar. Who hasn't heard of Les Paul? If you haven't, he was an American jazz and country guitarist and best known for his development of the electric guitar making the rock & roll sound possible. Did you know one of his nicknames was "Rhubarb Red?" He referred to this name as his "hillbilly alter ego." Combine flour, 1/4 cup sugar, baking powder and salt. Add cream and mix on low speed (or by hand) until just combined. Turn dough out onto a lightly-floured cutting board and gently knead the rhubarb and ginger into the dough. Shape it into a round disk, about 1-inch thick, and then cut into wedges. Prepare a baking sheet with parchment paper and set the wedges onto the baking sheet. Brush with the reserved 2 tblsp. of cream, then sprinkle 1 tblsp. sugar over top. Bake for about 15 minutes, until lightly browned. Cool, and enjoy! Makes 8-12 scones, depending on the size of the wedges. Looks like a good rainy day recipe. Note - a reader substituted yogurt for the cream. This could be an option. In a bowl, cut butter into brown sugar till crumbly. Stir in rhubarb. Spoon mixture evenly into 12 WELL GREASED muffin cups - Don't use paper cups. In a mixer bowl, cream butter or margarine, and sugar. Beat in the egg. Combine dry ingredients and add to creamed mixture alternately with cream. Spoon batter over rhubarb filling cups about 3/4 full. Bake 350° for 15-20 minutes. Cool 5 minutes and invert onto serving tray. Serve warm. Speaking of recipes worth trying, I would like to point you to a blog when you have a moment. These people are attempting to cook something different everyday for a year as a way of discovering new dishes. How cool is that? They sent me a lovely note and a link to some great rhubarb dishes. Please give them a visit at Is It Worth Waiting For? 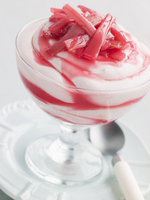 , and I think a number of their rhubarb dishes are found at BBC Good Food . You may find a number of recipes worth waiting for yourselves here. Would you like a lovely kiss? Parfums Salvador Dali have announced the launch of a new fragrance, Lovely Kiss, as part of their ‘Kiss Collection’. Lovely Kiss was created by Delphine Lebeau-Krowiak of Takasago, and contains fruity top notes of grapefruit-blackcurrant sorbet, pink peppercorns and rhubarb combined with floral notes of pink peonies, violets and litchi blossom, and a base of white cedar, patchouli and white musk. This perfume is geared to the women who like to experiment alot with new fashions and trendy items. I've had a question from a reader in Southern California. 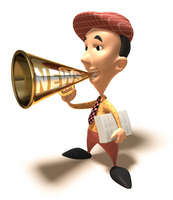 If anyone out there cares to comment at "rhubarb expertise" it would be appreciated, or email me if you don't mind. I have found mixed opinions on the subject of what kind of rhubarb can be grown in this area? Or, does it really grow well here at all? It's nice to help fellow rhubarb lovers if possible. 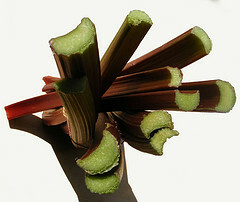 We welcome any special tips/advice/stories/ about your rhubarb you might care to share! Please feel to do so at Rhubarb Expertise . 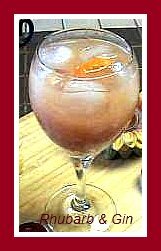 Stay in touch for some rhubarb drink recipes not on the site in June. Might be perfect weather for a sip or two by then.